The highly flexible Zoom LiveTrak L-20 is a 20-input digital mixer and multi-track recorder, well suited for live performances, studio recording, band rehearsals, podcasts, and more. The mixer features 16 mono channels, each with combo mic/line XLR-1/4" inputs with high gain, low-noise microphone preamps, +48V phantom power, and a single compression knob, while the two stereo inputs offer dual 1/4" and RCA inputs. Channels 1-2 also offer Hi-Z inputs for connecting guitars and basses. All channels work with the on-board channel strip, which provides a low-cut filter, a 3-band EQ, a pan control, and two send FX for sending signals to the 20 built-in high-quality effects processor with two dedicated EFX Return channels. The LiveTrak L-20 features balanced XLR main outputs, while the six monitor outputs utilize balanced TRS 1/4" connectors, each with the ability to set up customized mixes. Simply connect your headphones or a stage monitor and adjust the levels to taste. There are nine snap-shot presets, which allow you instant recall of different setups and sessions. The built-in SD recorder can simultaneously record every channel and the master fader stereo signal output for a total of 22 tracks at resolutions up to 24-bit/ 96 kHz. Files can easily be copied to a computer and used in a DAW. In addition, overdubbing and punching in/out can be done as expected when using the unit as a multi-track recorder. The L-20 can also function as a 22-in/4-out USB audio interface, allowing you to record directly to your favorite software DAW or to iOS devices. Other notable features include 12-segment LED meters on all channels, a built-in metronome, and a built-in slate mic for identifying takes. The Zoom LiveTrak L-20 ships with a power cord and a USB cable. Box Dimensions (LxWxH) 21.2 x 18.0 x 5.8"
LiveTrak L-20 - 20-Input Digital Mixer & Multitrack Recorder is rated 5.0 out of 5 by 3. Rated 5 out of 5 by David from Zoom Livetrack L20 Easy to use, record, mix, light weight, portable, tool that can capture the entire band, vocals, instruments and now a full set of drums on individual tracks, for live enesemble sound capture and post manipulation as desired. Finally, decent live band performance sound capture for videos and other needs. Allows for moving a step beyond limits of just recording PA speakers by allowing individual sound source channel capture blended to taste, and all at a great price. Rated 5 out of 5 by Brian from Zoom Live L-20 This is one handy mixing and recording device! Ive only had one opportunity to use it since I purchased it. I recorded a drum kit with 10 channels of the 20 available channels and the device didnt miss a beat (all puns intended). I am very pleased to own it and will highly recommend it to anyone who needs up to 20 channels of signal inputs. Rated 5 out of 5 by Michael from Love this thing Not as sophisticated as Logic Pro or Pro Tools, but great to capture the sound and can download wavs to other programs. 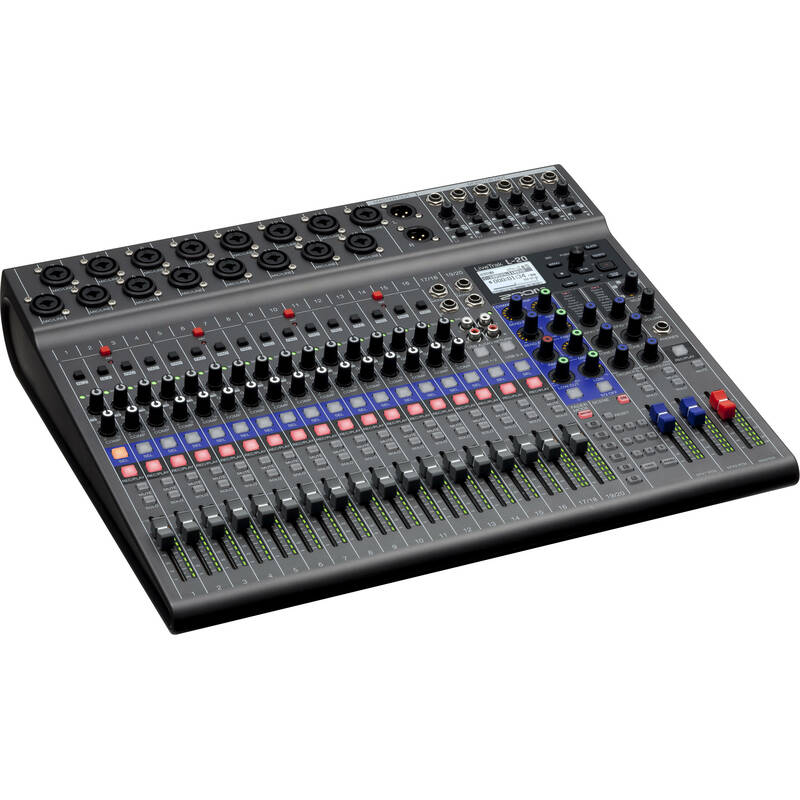 Is it possible to &ldquo;cascade&rdquo; two of these mixers together, to work as one, doubling track count, like you can with zoom R24/r16? Unfortunately, no, two L-20's cannot be synced in this fashion. Can you load a mix to two tracks and have it there for others to more add tracks later? Yes, you can import a file (such as the master bounce of a mix) into a project using a USB flash drive in USB HOST mode. After importing a file, you can use all other open channels to record more tracks. Does it have an &quot;auto mix&quot; feature? No, there is no auto mix or Dugan option available on this mixer.